MitoXpress® Xtra �C Oxygen Consumption Assay [HS Method] Plate-based measurement of Extracellular Oxygen Consumption (OCR). For cell-based, isolated mitochondria, 3D culture, and isolated enzyme applications. Plate-based measurement of Extracellular Oxygen Consumption (OCR). For cell-based, isolated mitochondria, 3D culture, and isolated enzyme applications. 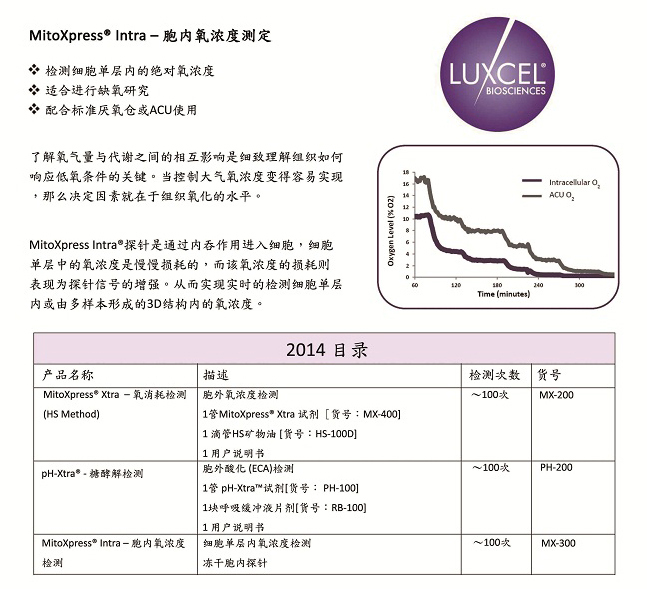 MitoXpress® Xtra reagent Lyophilised water soluble oxygen-sensing probe. Lyophilised water soluble oxygen sensing probe. HS Mineral Oil High sensitivity mineral oil, to restrict oxygen back diffusion. pH-Xtra® Glycolysis Assay Plate-based measurement of Extracellular Acidification (ECA). For cell-based and 3D culture applications. Plate-based measurement of Extracellular Acidification (ECA). For cell-based and 3D culture applications. pH-Xtra™ reagent Lyophilised water soluble probe for the measurement of Extracellular Acidification (ECA) or pH. Respiration Buffer Low phosphate-buffered media, for the measurement of extracellular acidification (ECAR). MitoXpress- Intra (NanO₂) Lyophilised water soluble probe for the measurement of Intracellular oxygen consumption. MitoXpress- Intra-5 (NanO₂) Lyophilised water soluble probe for the measurement of Intracellular oxygen consumption.